One of the major players on the Paris hotel scene, Esprit de France has followed up the recent opening of its art deco-inspired Hôtel du Rond-Point des Champs-Elysées with Maison Armance, an intimate abode in the upmarket 1st arrondissement. Tucked away behind an old coachman’s door on the legendary Rue Cambon, privacy is at the heart of this secluded new address. 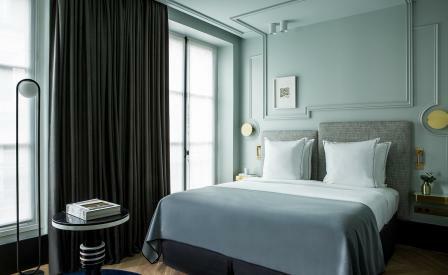 Design studio Double G has imbued the hotel with all the charm and comforts of a Parisian pied-à-terre, while also paying homage to building’s former life as the residence of French author Stendhal, who called the building home at the beginning of the 19th century. Turning traditional hotel design on its head, the reception and lounge areas crown the hotel in the top floor attic space, where, in another nod to Stendhal, the décor takes its cues from a French literary salon with velvet armchairs, low-lit side lamps, and when the weather calls for it, a roaring fire. The pièce de résistance however is a striking view of the city’s iconic rooftops, with shades of storm grey, zinc, and deep night blue throughout the hotel echoing the Parisian skyline. Downstairs 20 serene guestrooms are furnished in soothing shades of duck egg blue or soft creamy pink, with each retaining the high ceilings and parquet flooring of a classic Haussmannian apartment. Meanwhile, a chic monochrome mix of cream and black in the bathrooms is reminiscent of noteworthy neighbour Chanel.